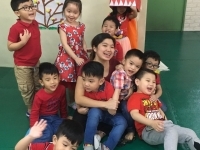 On February 8, 2019, we celebrated the Chinese New Year. Cambridge Congressional kids danced and sang Chinese Nursery Rhymes during the Big Circle Time. 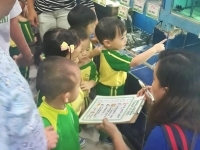 In preparation for the Culminating Activity: O-fish-ally Home, the Toddler and Junior Nursery 1 kids went to BioResearch, SM North Edsa. 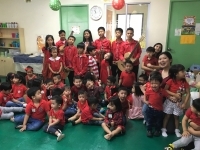 Last December 14, 2018 Cambridge Congressional kids had a unique way of celebrating Christmas. Instead of receiving gifts, they donated some of their toys to Children's Joy Foundation. You can find magic wherever you look. Sit back and relax, all you need is a book. - Dr. Seuss Cambridge Congressional kids dressed up as a character in their favorite book during the book week celebration. Cambridge Congressional held its first Trunk or Treat on October 24, 2018. This year's theme was CHILDREN'S FAVORITE MOVIES! The kids together with their parents decorated and transformed their car trunks based on the different children's movies assigned to them. They worked in groups and demonstrated teamwork as they prepared lots of candies, loot bags and games for everyone. The kids also dressed up as characters of the movies. Everyone looked so cute and fabulous! 'Til our next Trunk or Treat! The Mid-Autumn Festival is a harvest festival celebrated notably by the Chinese and Vietnamese people. 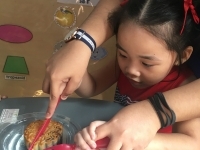 Last September 28, 2018, Cambridge Congressional celebrated Mid-Autumn Festival during their Friday Free Day. 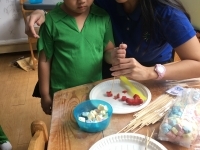 Last August 2018, Cambridge Congressional celebrated Buwan ng Wika. 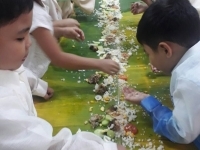 The kids got to experience their first boodle fight, eating classic Pinoy food with bare hands. They surely had fun! Before going home, they play the "Pabitin" game which is also a classic in Filipino's children parties. The kids dressed up in their glamorous Barong Tagalog and Filipiniana dresses.